(1530-1578) Uesugi Kenshin is a famous samurai from Echigo Province (in what is modern day Niigata Prefecture). 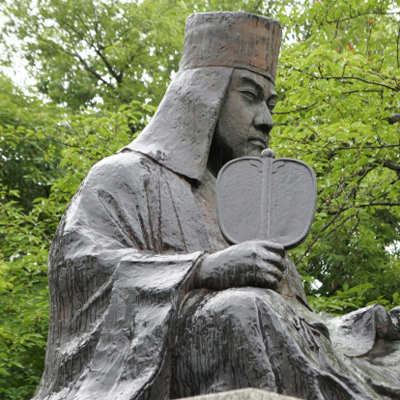 He is most well known for his rivalry with another well-known samurai, Takeda Shingen. Uesugi believed that he was the reincarnation of Bishamonten, the god of war and he demanded that his subordinates regarded him as such. The Uesugi family often made agreements under the watchful eye of their holy protector in the Bishamonten Hall at Kasuga Castle. One day, there was an emergency and there was not time to travel to the Bishamonten Hall to ratify an accord. At that time Kenshin declared that swearing in front of himself would be sufficient, “because I am Bishamonten.” The negotiations went through successfully. Wielding the power of Bishamonten, Uesugi Kenshin won many battles. An important turning point in his life came when he was 23 years old. Kenshin was given the position of Kantou Kanrei, the general governing the Kanto region of Japan. He went with a force of 8700 to attack the powerful Houjo family in Odawara. On the way there Kenshin was able to convince many other samurai to join up with him. When they arrived at the Houjo’s stronghold Kenshin’s forces has swelled to 115,000. No other general at the time could have lead so many troops. This shows just how charismatic Uesugi Kenshin was and his amazing ability to attract people to him. If you were to choose one battle to call the most important of his life, that would be the Battle of Kawanakajima. This is actually a series of five different conflicts that Kenshin had with his rival Takeda Shingen. In 1553 Shingen tried to invade the Shinano region, which was under the control of Kenshin’s retainer Murakami Yoshikiyo as well as a number of other samurai. 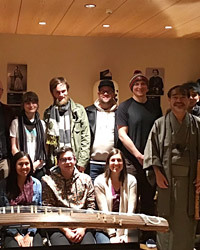 Though Kenshin did not have any connection to many of the samurai who called upon him for assistance, he went to the assistance of all of them out of a sense of righteousness. The first three battles were conflicts that were rather quickly resolved but at the fourth battle Kenshin and Shingen confronted each other directly. Kenshin was able to make his way to Shingen’s camp and attack him directly with his sword from horseback but Shingen blocked the attack using his war fan. Kenshin just laughed and rode back to his camp. Eventually this battle ended in a draw as well. While Kenshin had a longstanding rivalry with Takeda Shingen he was insistent on defeating him only on the battlefield and not through any nefarious means. His direct attack during the fourth battle shows us a lot about Kenshin’s values and his willingness to put his life on the line alongside his men.